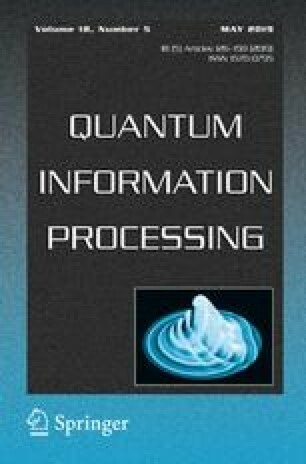 The quantum one-time pad (QOTP) usually serves as the quantum encryption to encrypt quantum messages in arbitrated quantum signature (AQS) schemes. The original QOTP is a qubit-by-qubit encryption algorithm with message and encrypted signature always appearing in pair in AQS, which will lead to the vulnerability of the AQS scheme. By comparing the two quantum state pairs in AQS with the C-SWAP attack, it is possible for the attacker to obtain the signer’s key, which leads to the security weakness of AQS. Accordingly, we propose a new attack on AQS scheme for the first time. In order to deal with the attack on AQS scheme, QOTP must be replaced by an improved quantum encryption scheme. Based on QOTP with confusion, we proposed an improved quantum encryption scheme which can resist the attack in AQS scheme. Security analysis shows that the improved quantum encryption scheme works efficiently and securely. This work was supported in part by Natural Science Foundation of the Education Department of Anhui Province (Grant Nos. KJ2018A0363, KJ2017A356, KJ2017A363), Quality Engineering Project of Colleges and Universities of Anhui Province (Grant No. 2017mooc235) and Anhui Provincial Natural Science Foundation of China (Grant No. 1708085MA10).